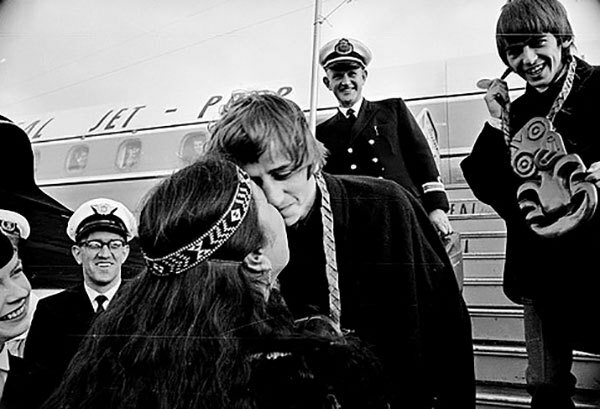 In 1964, on a sunny Sunday afternoon in mid-winter, 7000 Wellingtonians made their way to Rongotai airport to greet four Liverpudlian musicians who combed their hair forward. 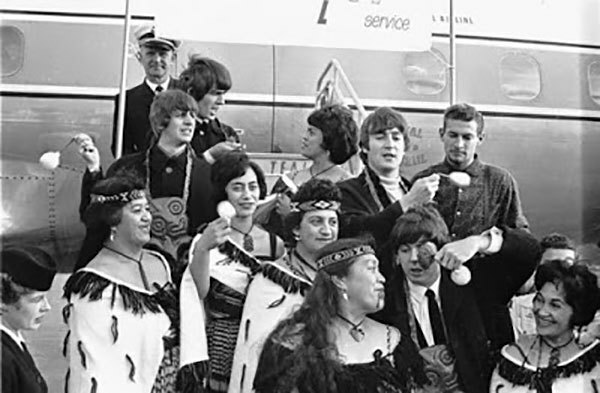 The Beatles’ eight-day visit to New Zealand has been well covered in the 50 years since they first touched ground in Wellington, and memories are conflicting and keep getting adjusted, but questions still remain. Why, so early in their career, did the band get such a reaction in New Zealand? And what song was it that Paul McCartney worked on later that night while trapped in the St George Hotel? We already had rock and roll stars of our own: first Johnny Devlin, and more recently Max Merritt and The Meteors, and Ray Columbus and The Invaders. And we had already received several visits by stars of the early rock and roll era: first Johnny Cash and Gene Vincent, then Johnnie Ray, and only a few weeks before The Beatles, a package tour featuring Gerry and the Pacemakers, Dusty Springfield, Gene Pitney, and Brian Poole and the Tremelos. This April 1964 tour – promoted by Harry M Miller – was billed as “the wild Liverpool Sound show”, though only the Pacemakers crossed the Mersey. 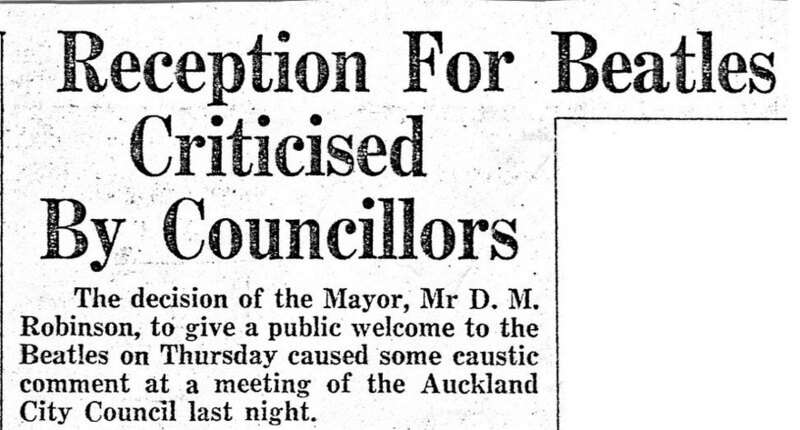 None of these visits compared to the welcome given to Nat “King” Cole, who drew 5000 Aucklanders – most of them young women – to Whenuapai airport when he arrived for a concert in January 1955. Awareness of The Beatles changed quickly. From ‘Please Please Me’ on, all the group’s classic singles had been released in New Zealand on Parlophone through His Master’s Voice (NZ) Ltd, soon after going on sale in Britain. But in the weeks between the “Liverpool Sound” show and The Beatles’ tour, there was a deluge of extra releases. From late April through to June 1964, HMV released as New Zealand singles ‘Can’t Buy Me Love’ b/w ‘You Can’t Do That’ (from the film A Hard Day’s Night, which wouldn’t come out until July), and several other singles taken from early albums or EPs: ‘All My Loving’ b/w ‘Roll Over Beethoven’, ‘Twist and Shout’ b/w ‘Boys’, ‘Money’ b/w ‘Do You Want to Know a Secret’, and ‘Long Tall Sally’ b/w ‘I Call Your Name’. 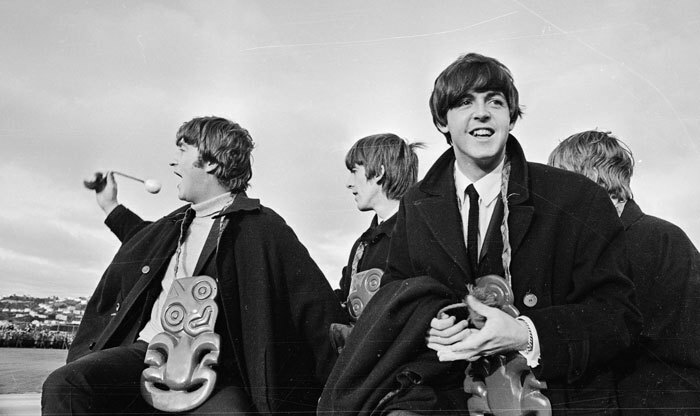 Even with very little radio air-time being devoted to current pop music, it is no wonder that New Zealand was well prepared for The Beatles’ visit. Perhaps HMV realised how its USA equivalent, Capitol, had dropped the ball in the year prior to the group’s pivotal appearance on The Ed Sullivan Show four months earlier. Undoubtedly HMV’s parent company in Britain, EMI, had more clout over its colonial subsidiary. Whatever, the New Zealand company had its publicity machine well-oiled. 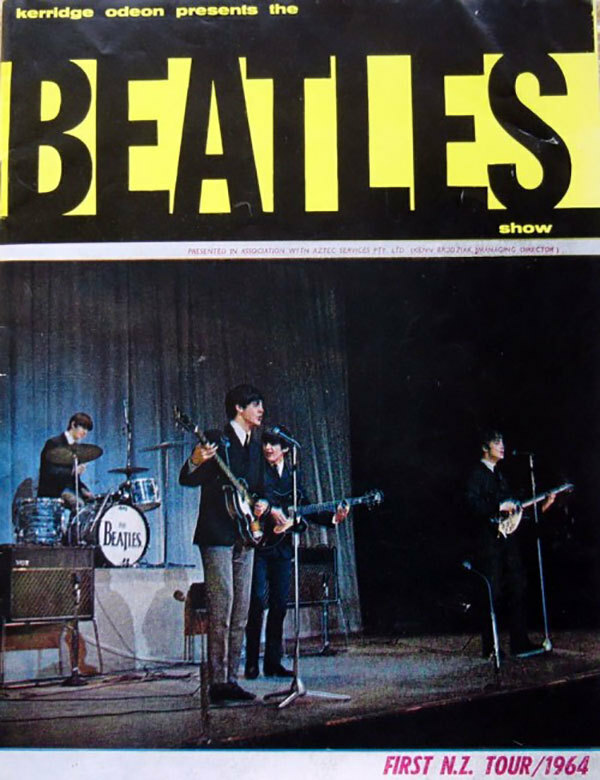 The influential entertainment magazine Playdate featured The Beatles on the cover in April (their tour was promoted by Kerridge-Odeon, which owned Playdate). Also, footage of The Beatles’ arrival in Wellington shows many fans holding up copies of With The Beatles, their most recent album, and many other fans wave professionally produced placards of welcome. 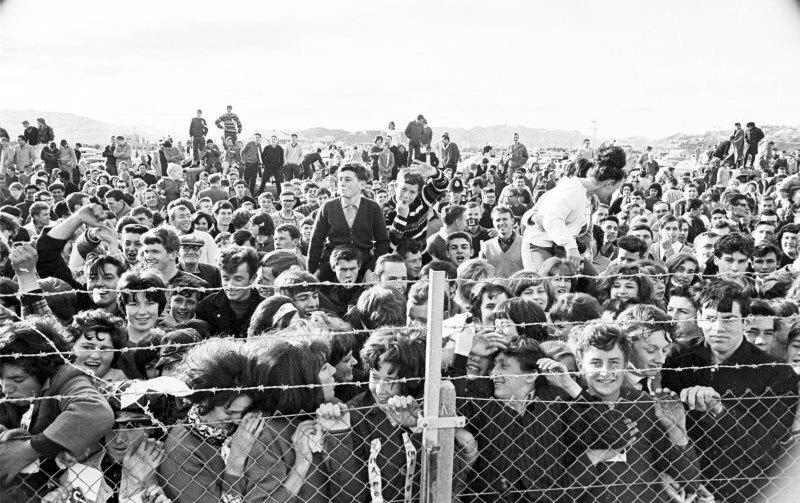 Still clutching their poi, and standing on the back of a slow-moving Holden ute, The Beatles were driven around the perimeter of the airport to greet the 7000 fans pressing against the chain-wire fence. Then they were driven into central Wellington – followed by a motorcade of fans in cars – to check into the St George Hotel on the corner of Willis and Boulcott Streets. 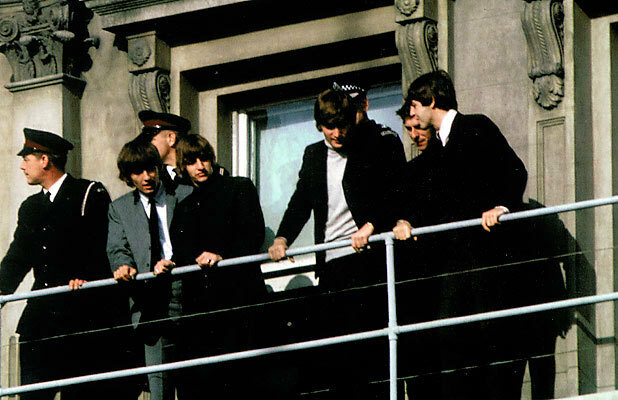 The group made their way to the third floor balcony to greet the fans, who were then told to disperse by an official with a loud-hailer: The Beatles weren’t going to be re-appearing. A frenzied press conference followed, attended by journalists such as Jim Hartley, female radio hosts Robin King and Doreen Kelso, and Johnny Douglas and Pete Sinclair of The Sunset Show, ZB’s hip, daily pop radio programme. 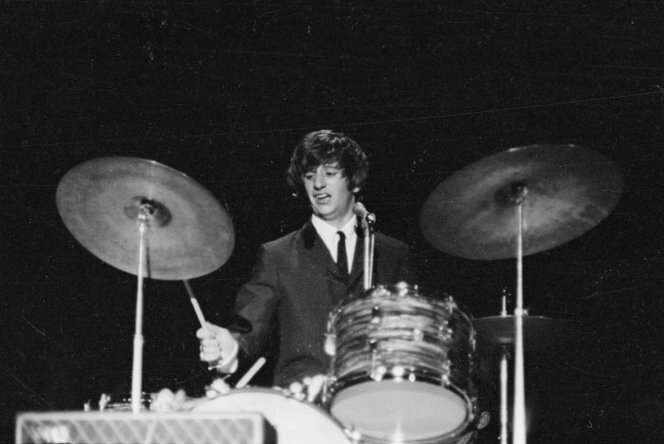 Douglas got all The Beatles to record stings for the programme – “Hello New Zealand, this is Ringo” – and Sinclair ended up spending quite a bit of time in The Beatles’ company over the next couple of days, recording interviews for The Sunset Show and moonlighting for Australian radio. 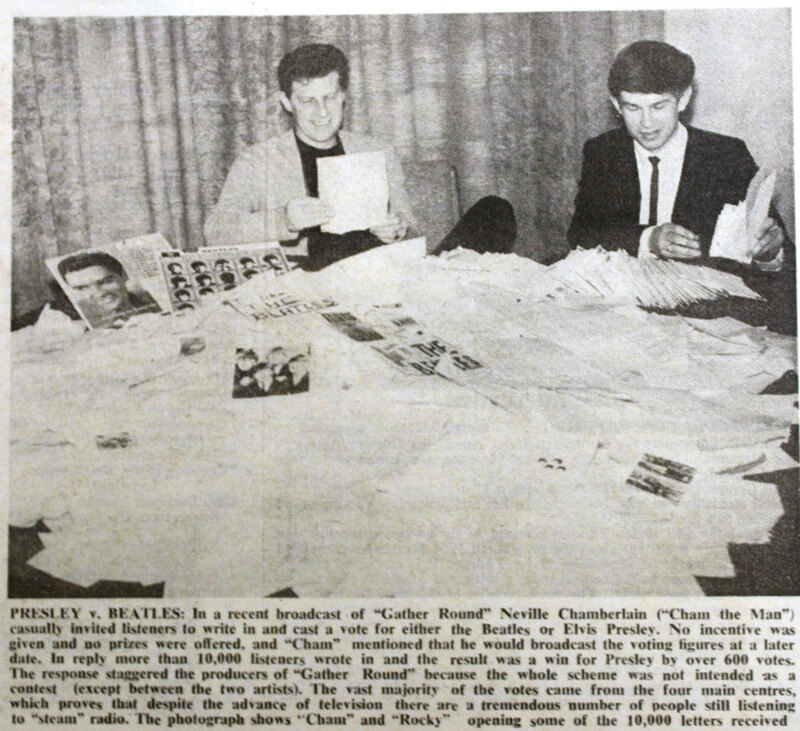 The results of a radio competition in Wellington in 1964. Counting the results are Neville "Cham the Man" Chamberlain and Rocky Douche who would later own Marmalade Studios. Drewitt was an old-school hotel manager. He was still the manager when I asked him about the visit 20 years later. He cautiously wrote out his memories: “During their stay, school girls tried climbing up the fire escapes after school. They’d get to the entrance of the suites but were put in the lift and were sent back to the ground floor. “The only unpleasant incident was when a girl who had booked herself into the hotel tried to persuade a security guard to let her into The Beatles’ room. When he said she had no chance, she threatened to cut her wrists. He didn’t think she was serious, but when he ignored her, she took out a razor blade and slashed her wrists. She rushed back to her room and bolted the door. But I noticed the window to her room was slightly open, so a policeman got out onto the fire escape, pushed it open and got inside. She was there with a towel wrapped around her wrist. We sent for an ambulance and she was taken to hospital. “The Beatles were playing a big game, with big money at stake, so they couldn’t afford to put a foot out of step. We had no problems with them, but the support band [Sounds Incorporated], who never had anything to do with The Beatles, played up – they messed up their rooms, damaged furnishings, even slashed some mattresses. 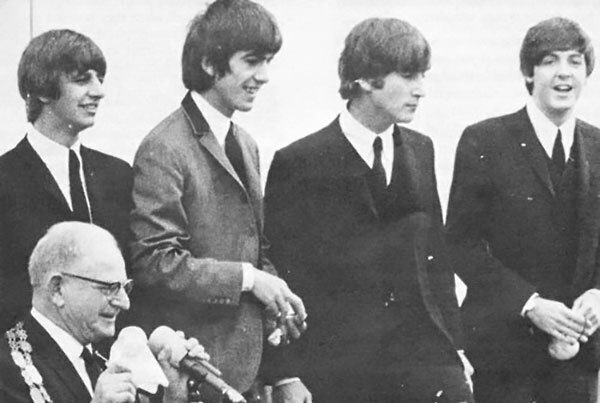 Another who got an interview was Victoria University psychology lecturer Tony Taylor, who wanted to examine “the general personality pattern of The Beatles fans and the specific clinical features of hysteria and of neuroticism that were attributed to them.” Taylor interviewed Lennon, and attended one of the concerts. Under his coat he had a small reel-to-reel tape recorder – which mostly picked up screams, his main interest – and he had a dozen psychology students around the hall taking notes on fans’ behavior. Later, he got the young composer and music lecturer Jenny McLeod to analyse the beats versus screams ratio on the tape. “She found a selection of Beatles tunes varies from 67 to 200 beats per minute, with a mean frequency of 135,” Taylor wrote in his memoir. 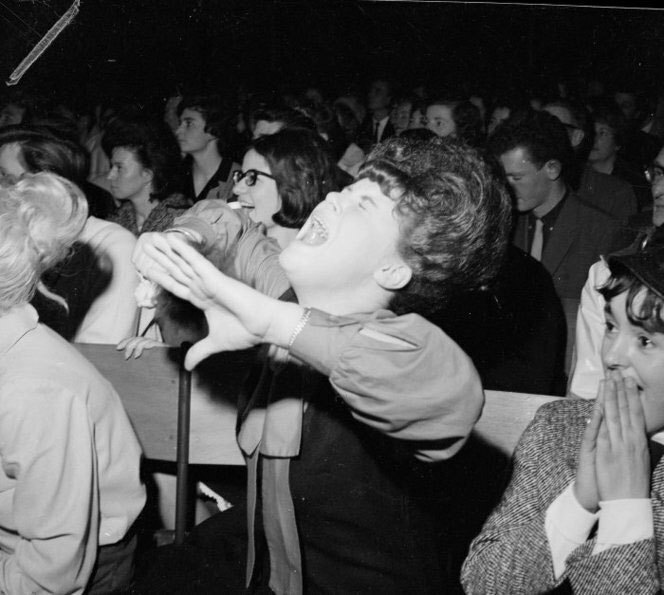 The academic paper he published was called Beatlemania – the Adulation and Exuberance of Some Adolescents. 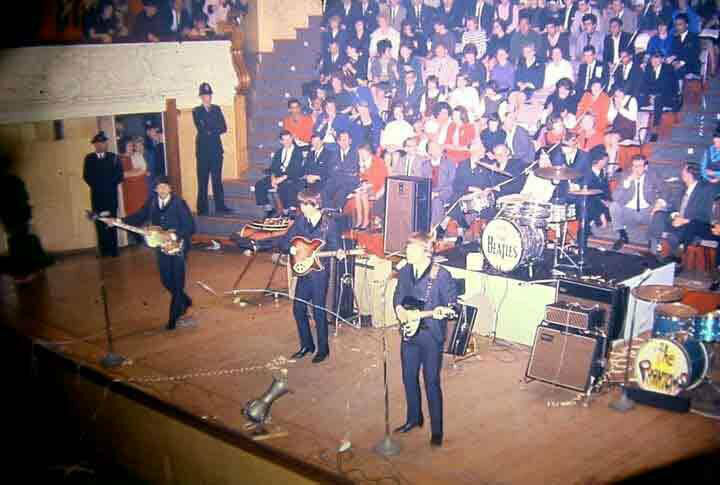 After the first two shows on Monday night, there was a small gathering back in the hotel; The Beatles shared twin rooms, which also had lounges. 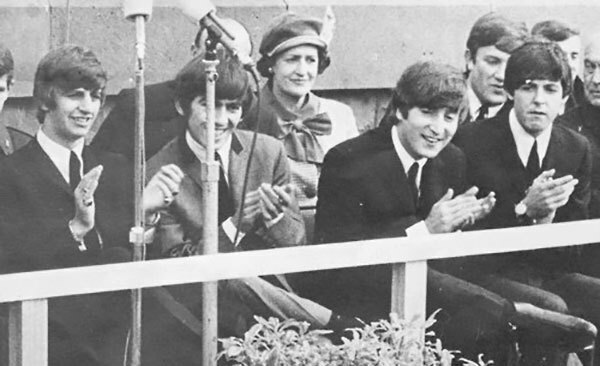 Cadwallader, who attended the shows with Derek Taylor, wrote that when the other Beatles went to bed – Ringo in his pink pajamas – McCartney entertained those left at the small party with the acoustic guitar. 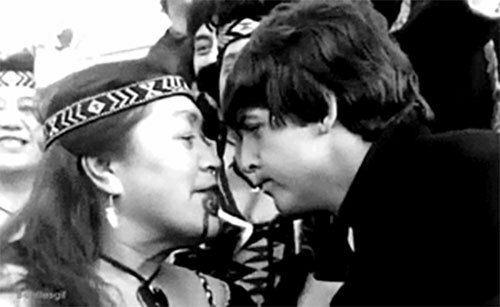 While there is no evidence to suggest anything disreputable took place while The Beatles visited New Zealand, I did get the feeling that Drewitt and his wife had signed an old hoteliers’ pact that prevented them from saying anything controversial. The biggest fuss came at the first Wellington concert, at 6pm on June 22: the group was angry that the Town Hall’s in-house PA was woefully inadequate and underpowered. Johnny Devlin, one of the support acts, spoke to the volume-hesitant Town Hall sound man, and offered to help improve the PA for the next day’s two concerts. He contacted Philips Industries and an alternative PA was hired. A roadie who helped set it up told me the replacement PA included several 100 watt amplifiers, a big Altec flare speaker and a couple of 15-inch speakers by the organ at the back of the hall, and a couple of columns of speakers on each side of the stage. 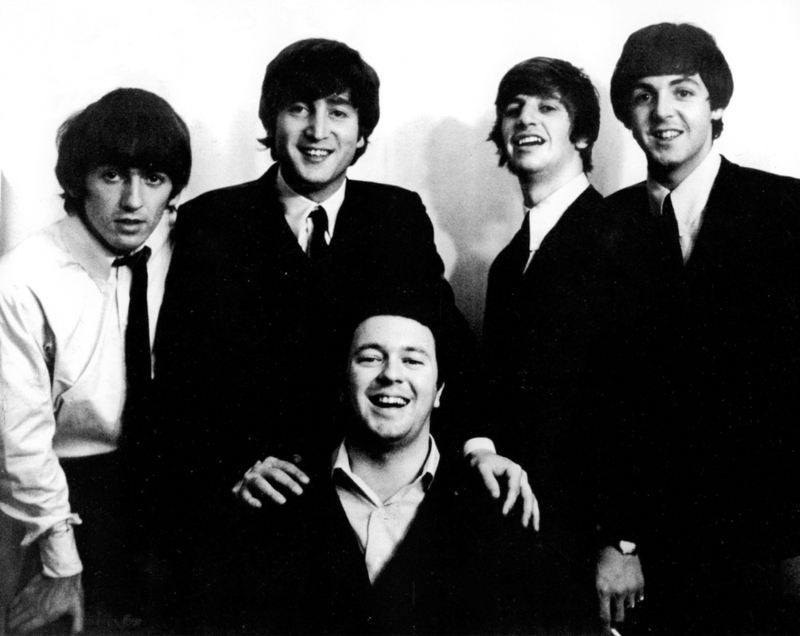 When Devlin was asked what he wanted in return, he just said “a photo with The Beatles”. The group obliged. 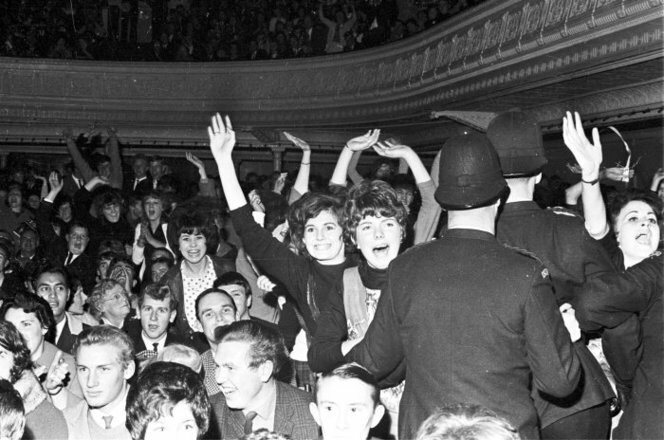 The police were unprepared for the frenzied reaction of the fans at the concerts. At first the constables sat in the front row, with their helmets underneath. They found this left them flat-footed when it came to the stage invasions that constantly took place. So for the second show they were seated in front of the stage, but facing the audience. Lennon said later, “It was a bit rough. I thought definitely a big clump of my hair had gone. I don’t mean just a bit. They’d put about three policemen on for 3000 or 4000 kids and they refused to put more on. ‘We’ve had all sorts over ’ere, we’ve seen them all,’ they said, and they had seen them all as we went crashing to the ground.” Angry, Lennon threatened he wouldn’t perform that night unless more police were on duty. In the end the impasse was solved when it was decided that a civic welcome was appropriate, but not a civic reception. The Mayor would wear his chains of office, but not his robes. 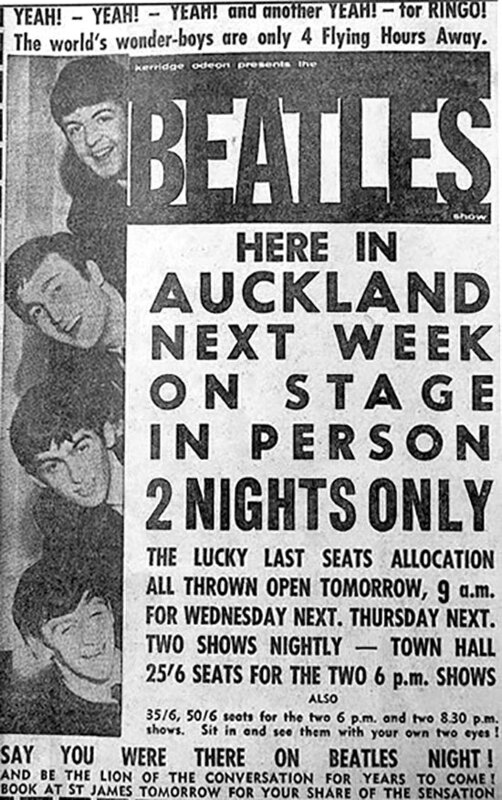 Another establishment body that disapproved of The Beatles’ visit was the Auckland Education Board, whose officials took the names of school-age fans who attended the welcome outside the Town Hall, and said they were going to prosecute their parents. At the concert, it was mayhem again. As was usual for the time, the show had a packaged, variety-style format. Comedian Allan Field acted as compere, warming up the crowd then introducing Johnny Devlin. Australian singer Johnny Chester followed – both singers were backed by well-groomed Melbourne group The Phantoms – and then, horn-based instrumental group Sounds Incorporated. The crowd at the City Hotel, Dunedin. The arrow points to the band. 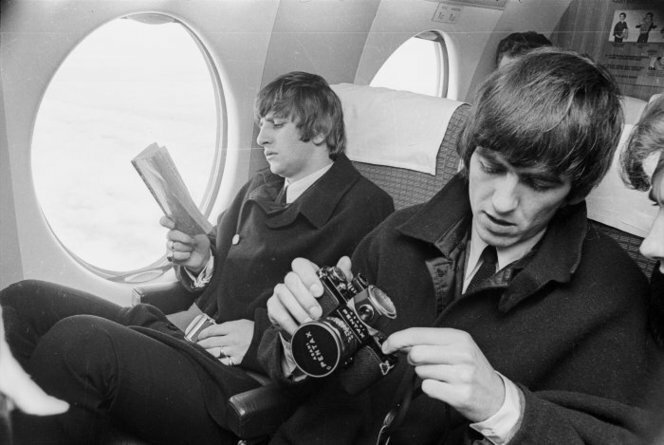 On Thursday 25 June, The Beatles flew to Dunedin. Their plane was 30 minutes late because a phone call had been received in Auckland saying there would be a “germ bomb” on board. Suspecting it was a prank from a member of the tour entourage, an Auckland police inspector reportedly locked the bands’ stage gear up for the night at their headquarters, and his men searched through the personal luggage of the party. 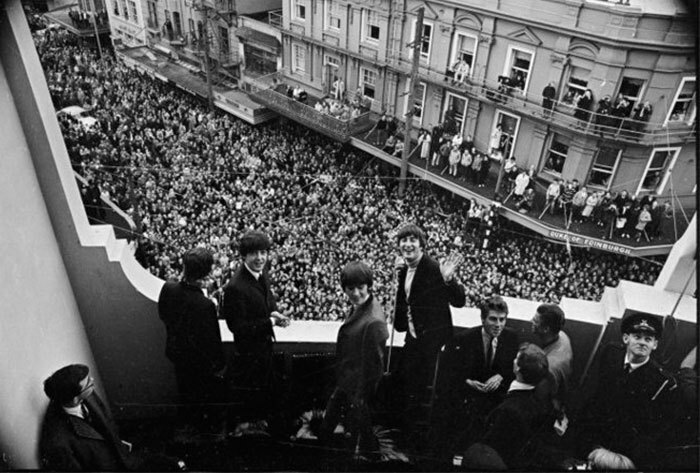 The incident that dominated The Beatles’ visit to Dunedin occurred when they arrived at the City Hotel. The police were unprepared for the hysteria among the 2000 people outside, who crowded the entrance and climbed onto the verandah above. The police took 10 minutes to form a gap in the crowd, and were jostled as they escorted the band. John Lennon was the last out of the car and by this time the police and security men had had enough. 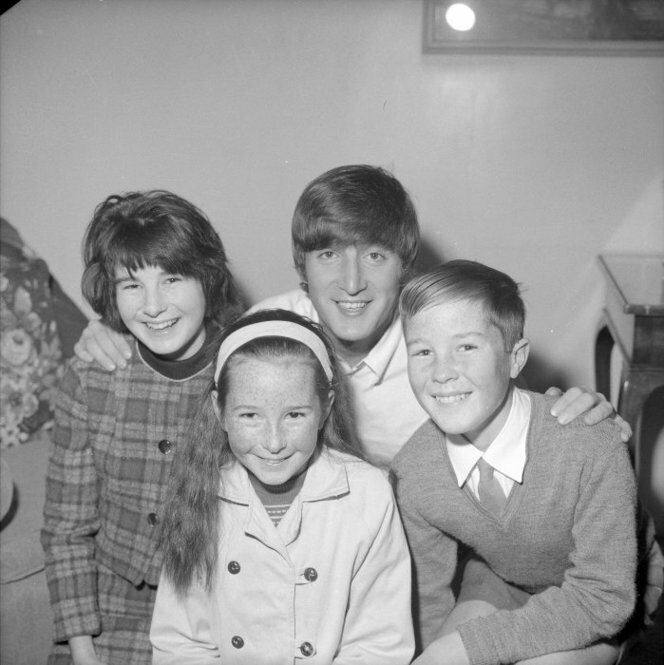 Dunedin broadcaster Neil Collins remembers the police picking up Lennon and throwing him through the front door. “I mean that. 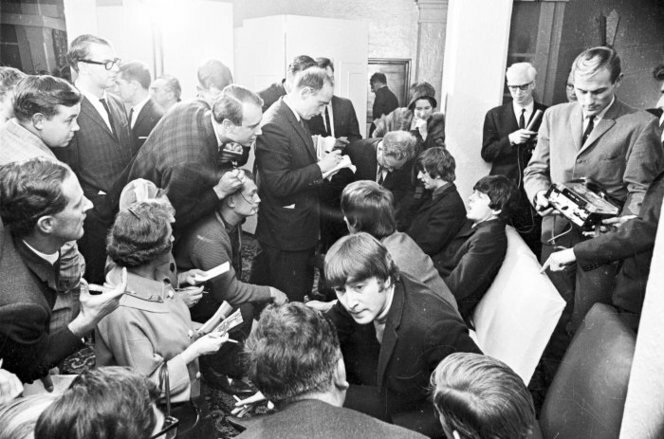 He was airborne when he reached that lift, and he was wearing leather pants and he cut his knee open on the iron of the lift.” Lennon stormed up to his room on the third floor, and refused to attend the press conference. 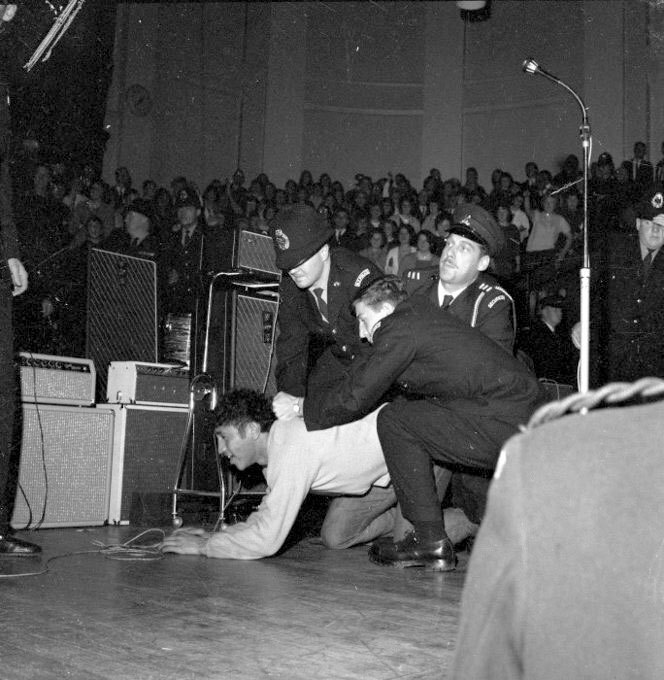 That night, Collins was asked to be a decoy while The Beatles were sneaked into the Town Hall. With him was Russell Clark (later a business partner of Benny Levin and Craig Scott), Max Merritt and one of his Meteors. “The promoter said, ‘If you do this for us you’ll get to meet them later for supper. Turn your collar up, comb your hair forward, put your head down and race through the crowd to the limousine. It’s as simple as that, lads.’ We all thought it was great fun, so we did it, but as we did the crowd surged forward and there were people yanking and pulling at our hair. At that moment I wondered why I’d said yes, because it was quite terrifying. “Before the car could move off the noise inside was deafening, with everybody bashing on the outside, and there was lipstick smeared all over the car. So off we went, and I can still see two old ladies outside Hallensteins waving frantically, so of course we got right into the act and waved back. Wayne Mowat, a Dunedin teenager and aspirant musician who later became a long-serving RNZ broadcaster, went to the 8pm show. “When we arrived I remember all the school girls and their mates were in raptures about the first show. Some of the girls were almost hysterical. That was the effect The Beatles had. “We were about the eighth row from the front, and we were all quite well-built schoolboys and when The Beatles came on, we were suddenly at the back. There was a rush forward as soon as The Beatles came on in their mop tops and McCartney and Lennon started shaking their heads. That’s when hysteria really took over. The show up till then had been pretty sedate. They had Johnny Devlin on first and a comedian who introduced The Beatles but he was drowned out. 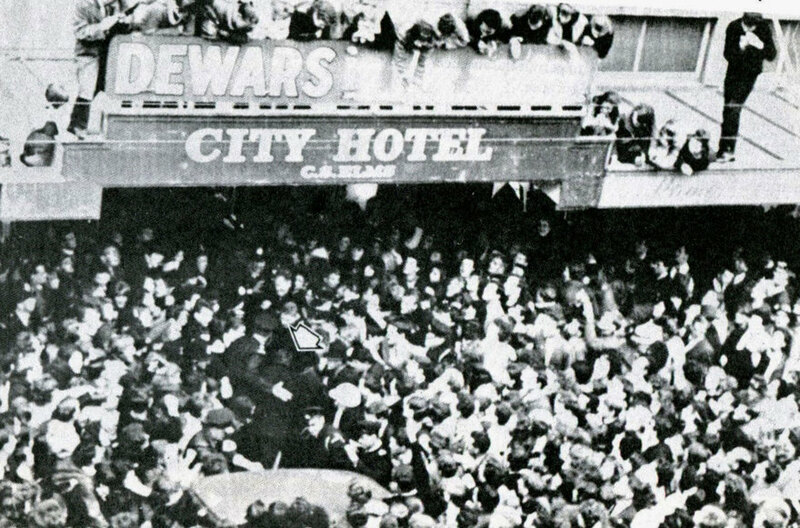 After the concert everybody streamed down to the City Hotel and chanted out ‘We want The Beatles, we want The Beatles!’ Finally they did come out onto one of the balconies, just like royalty used to do. “You could just hear the music. The crowd sat and listened to Paul McCartney sing ‘Till There Was You’’, one of the only soft slow numbers they did. The rest was just – loud. 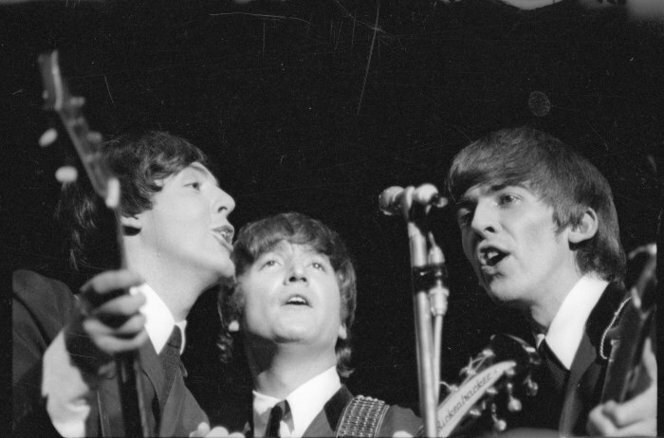 You couldn’t hear every note, but you knew it was The Beatles. No doubt about it. Show over, The Beatles left the stage and – driven by a traffic cop with siren screaming – they were back in their hotel within three minutes. Warned by the chaos that had occurred elsewhere in the country, the Christchurch police were better prepared. When The Beatles left Dunedin, the police took them on a route to the airport that was different to one published in the paper. In charge in Christchurch was George Twentyman, a police inspector later prominent during the Springbok tour. “We had a very flexible plan, but mainly to try and keep a distance between The Beatles and the young people,” he said. 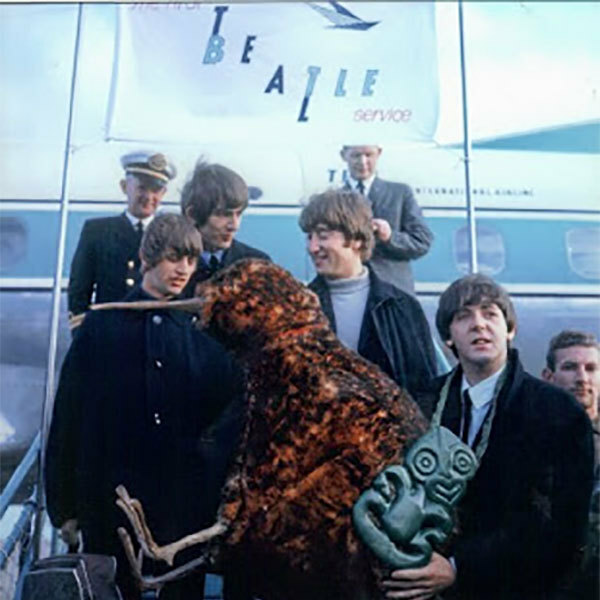 “Knowing they would go quite rampant if they were exposed too much to The Beatles, there had to be always quite a considerable space between The Beatles and the people, otherwise you’d have serious problems.” When The Beatles’ plane arrived in Christchurch, it was surrounded by police. 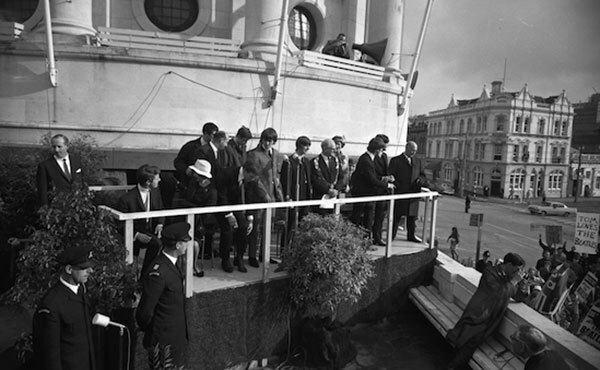 A car at the bottom of the plane’s stairs whisked the group away while a crowd of 5000 watched at a distance. The Beatles stayed at the Clarendon in central Christchurch, a grand old hotel where the Queen used to stay. 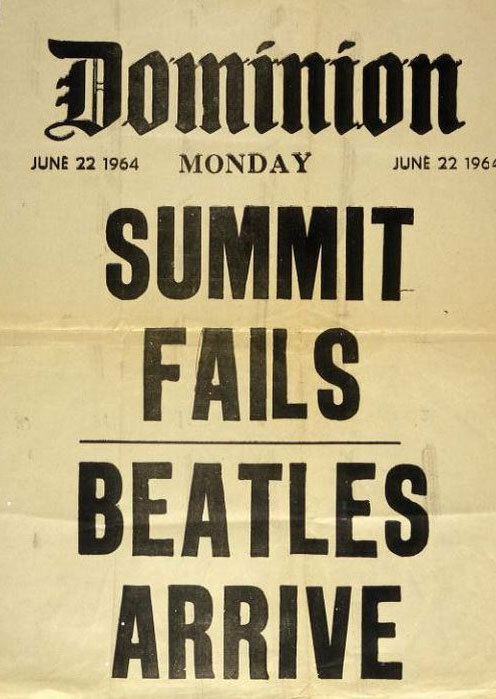 Once again, female fans used the usual tactics to get inside to meet them, such as hiding in laundry baskets, but the mania was such that as The Beatles’ car got near the hotel, a 13-year-old girl lunged at the vehicle and was knocked down. She was taken inside the hotel and, for her trouble, got to meet The Beatles. The two concerts at the Majestic Theatre were once again reviewed for their novelty rather than their music. ‘Till There Was You’ was the only song one newspaper reviewer mentioned, preferring melodramatic reportage such as “… the shock waves reached danger level. The shrieking guitars, amplified through some fiendish electronic system, led the assault with Ringo’s drums filling in the gaps between blasts. The half-crazed audience did its best to scream and whistle above it all.” Some of the disgruntled boyfriends must have bought tickets, because among the usual jelly beans thrown at The Beatles, there were also marbles. So it is understandable that The Beatles spent their last day in New Zealand in their Christchurch hotel rooms. When they left for the airport, the police – finally wise, but also a little mean-spirited – lined up outside the front door, where four cars waited. One limousine had its back door open, with a driver inside. 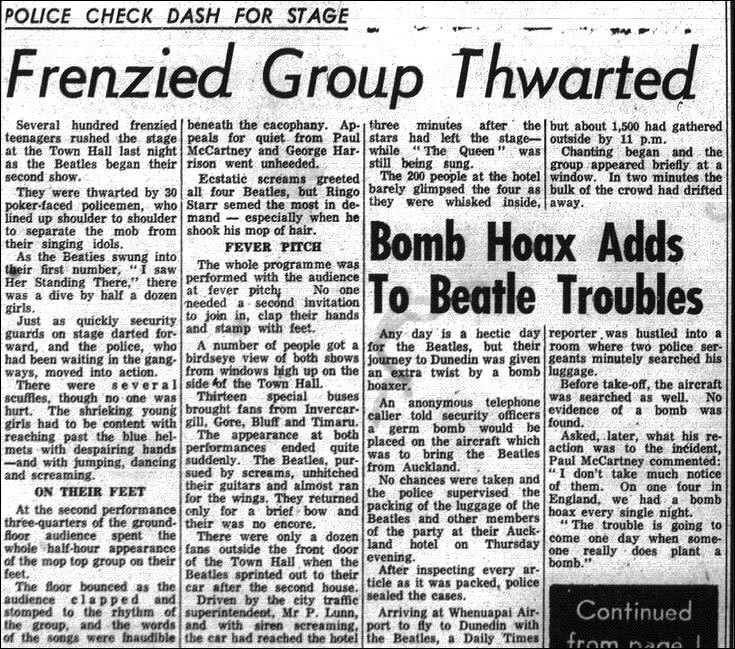 It was another decoy: as 2000 fans gathered at the front door for The Beatles to appear, the police took the group out through a back entrance to another car. At the airport that evening, another 2000 fans waited in the dark to bid them farewell. The runway had a brilliant, eerie glow thanks to the mercury vapour lamps used to light workers loading cargo for the Deep Freeze programme in Antarctica. A TEAL Electra taxied out; the distance from the public viewing platform and high wire fences to the plane was quite substantial, but still the police felt under pressure. Fifteen minutes before departure, The Beatles were driven onto the tarmac, and a boy ran towards the plane only to be grabbed by the police. 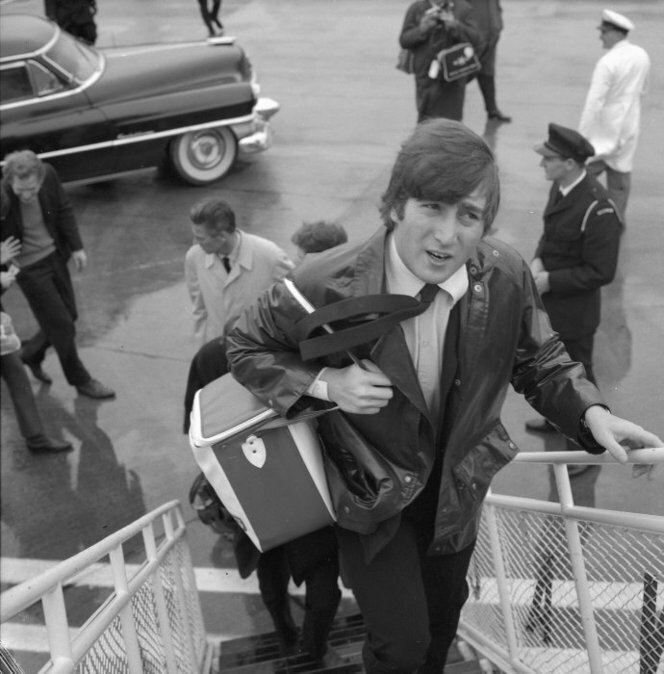 The Beatles stood briefly on the plane’s steps for photographs and a wave, then boarded the plane to Sydney.